Oh man I am so sorry do have to do this to you guys, but today we are going to be talking about summer! I know, I know it is but a distant memory but we are hoping this delicious little shoot will have you wandering back down memory lane as your relive the magic of the sunny season. We asked stylist Jemma-Jade to share her inspiration with us… “One of England’s top qualities is its garden’s in the summer months. There is nothing like a summer wedding on a beautiful manicured lawn in a country estate. 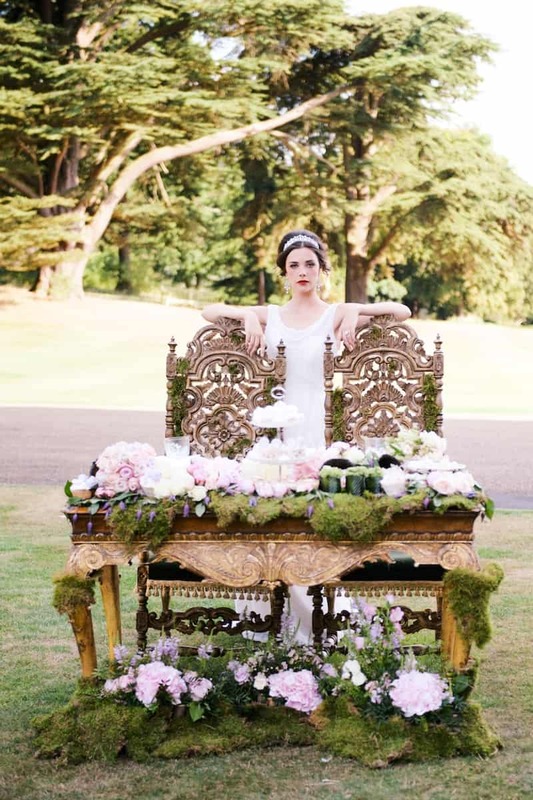 And this is exactly the setting that I wanted when creating my ‘English garden wedding inspiration shoot’. I wanted to share with you readers the magic in setting your wedding outside with the greenery as your backdrop. We held the shoot in the Brocket Hall Estate, set in 543 acres of beautiful Hertfordshire countryside. The Estate offers complete privacy whilst being easily accessible from London. The beauty of this estate its space, there are so many different areas indoor and outdoors to photograph your special day. We decided to use the Main hall with its stunning ballroom and sweeping staircase, as that’s where the bride got ready. Then we set our dining table and dessert tables in the gardens of the hall. The flowers tell the tale of an ‘Enchanted Forest’, a style that takes inspiration from nature with a fusion of blousy blooms and everything that denotes romance. The florist chose soft pastel shades combined with rich earthy tones. By using Hydrangea, English T Roses and ramblers such as Clematus with ruffles of Peony and fresh lush green carpet moss as our natural dressing, we can help create a look of majestic magnificence. We also stylise with old terracotta pots and grand church candles along with votive’s all being true to our natural exuberance. When I think of an English Summer garden, the colours that spring to mind are pastel hues of pinks, lilacs, yellows and greens. For the large cakes, we showcased 2 distinct looks. The first was a four tier cake decorated with lace butterflies, sugar butterflies and pastel sugar flowers. The second cake featured two oversized pink roses with cascading petals. The sweet table had a variety of edible delights including cupcakes, cake pops, macaroons and cookies in matching pastels. It was a true fest to the eyes! Everything came together perfectly. The flowers, the dresses, the makeup, the cakes, the surroundings… they all complement each other. All this comes to life in the images by the talented Kate Nielen. Her signature dreamy style really depicts the mood perfectly. That is all for today folks, I hope you enjoyed your little trip back into summer!